Two fantastic things happened in October of 1978. I was born, and so was Spumoni's, one of our favorite Italian restaurants. 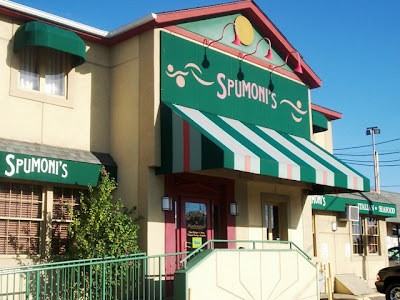 Located in Pawtucket, RI, Spumoni's has been a local favorite for nearly 30 years. Since Mom and I were in the area, and we had been yearning for a really good meal, Spumoni's was the obvious choice. We'd been missing it. Mom and I arrived at Spumoni's at around 4:15 p.m. They have a very large parking lot, and thankfully we had arrived just before the dinner rush. After grabbing a few take-out menus at the front counter, we were greeted by a polite young man who quickly ushered us to a table at the far end of the restaurant and left us with two large, colorful, plastic menus. Soon after, Angelica, our waitress, arrived to take our drink order. Both Mom and I ordered Diet Pepsis that arrived in large plastic glasses. Angelica also brought us a basket of their delicious Italian bread, served with butter packets. Although we already knew what we wanted, both Mom and I had quickly glanced through the new menu. We noticed some changes, but were glad to see that all our old favorites were still available. 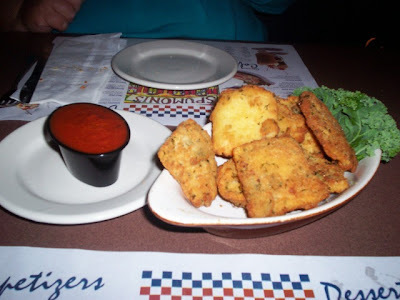 Angelica then took our order - an appetizer of fried ravioli ($5.25), and a regular four cheese pizza ($11.50). As our waitress walked away, Mom and I started devouring the bread. It is one of the tastiest Italian breads we've ever had. Mom has always wondered if they make the bread on the premises, or have it sent over from a local bakery. Either way, she always wants to take home a loaf. Spumoni's has a very family-style feel. With dark wood walls and booths, colorful paintings of Italian foods, and the hanging plants and strings of lighted ivy, coming into Spumoni's is like visiting an old friend. Italian music, both upbeat and romantic, is piped in through overhead speakers, and the individual lighted wall lamps and colorful menu-place mats allows Spumoni's to be both elegant and practical at the same time. The dining rooms (there are a few) are always spotless, the red and yellow checkered rug is always neatly vacuumed, and the mixture of booths and tables are set up in way where customers can access them easily. Spumoni's fills up fast, and we saw first hand how a quiet dining room can be turned into seating for a incoming party of 25. About four of five servers were setting up extra chairs and tables against a large bench at the corner of the room we were in. Although we left before the party arrived, the staff setup seemed quite effortless and very well organized. You can tell that they are used to serving large parties. 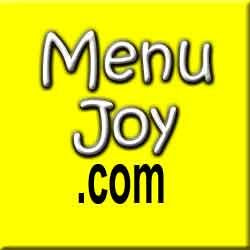 A group party menu is also available. Spumoni's has a very large menu, and one thing I love is that their take-out menu is actually the entire menu. Everything is listed! They also have a Web site, and what I love about it is that they actually list the prices! This is quite a rarity with some of these Internet pages, and I was glad to see that Spumoni's has nothing to hide from its customers. From Italian favorites to a variety of seafood options, Spumoni's has it all. Appetizers range from a $2 shrimp cocktail, to a platter of clams ala Zuppa for $11.50, which are little necks steamed in red or white clam sauce. Fresh salads and soups are available, such as Papa's Antipasto ($7.99) topped with selected Italian meats, cheeses, olives, a hard boiled egg, and Spumoni's special antipasto dressing, and the baked onion soup ($3.99) served in a crock and topped with a layer of melted cheese. There are several chicken dishes available such as the chicken parmigiana ($12.50), chicken and ravioli ($12.50), and chicken calabrese ($13.99), which is a breaded, boneless breast of chicken covered with sauteed mushrooms and oven roasted peppers, topped off with Spumoni's own sherried cream sauce and selected blend of cheeses. The Italian favorites range from a $7.99 stuffed manicotti, to an Italian Pu Pu Platter for $13.99, featuring veal, meatballs, sausage, peppers, manicotti, and ravioli topped with tomato meat sauce. With pizzas, burgers, sandwiches, and pasta by the pound, there is certainly a lot to choose from at Spumoni's. They even have something called A Tour of Italy for $11.50, where you can choose from six different Italian combo meals appropriately named The Tuscany, Roman, Palermo, Napoli, Sicilian, and The Pisa. Each "location" features three different Italian dishes all served on the same platter with your choice of soup or salad. The menu also suggests specific wines with certain dishes like the fettuccine Alfredo (Maso Canali Pinot Grigio) and any Tour of Italy combo (Beringer White Zinfandel). 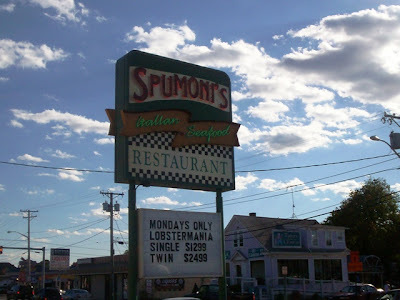 Spumoni's is also famous for their twin lobster special, and other lobster dishes such the steamed or baked New England style lobster, and the lobster/scallop casserole ($14.99). They have a children's menu and a dessert menu featuring a variety of liquored Italian coffees. Also served at Spumoni's is a wide selection of veal and steak choices, along with a special lunch menu that is served from 11:30 a.m. to 3:30 p.m., Monday through Saturday. Spumoni's also has an all-you-can-eat lunch buffet for $6.50 from 11:30 am. to 1:30 p.m. on Tuesdays and Thursday. Mom and I have visited this buffet once, and although on the small side, it had baked scrod, meatballs, Italian sausage, lasagna, and other Italian favorites. Everything was hot and delicious. Spumoni's even offers frequent diners a reward for their patronage - a dinner club card. Visit the Web site for detailed information. Almost immediately, Angelica brought over our basket of fried raviolis. Accompanied by a dish of Spumoni's homemade tomato sauce, these raviolis are a hit with customers. I often hear people ordering them, and they never take long to arrive. The raviolis are packed with cheese (no watery middles) and nicely fried so that they are crunchy, but not rock hard. Always served steaming hot, the dipping sauce adds a light sweetness to the thickly breaded raviolis. There were about eight of them on our plate, which means that we certainly got our money's worth. Each ravioli is a good size, and extremely tasty. It's our favorite appetizer. Our four cheese pizza arrived looking as delicious as ever. This pizza comes in three sizes - individual ($7.99), regular ($11.50), and large ($16.50). This is by far my favorite dish at Spumoni's. Mixed with garlic, olive oil, and diced tomatoes, the blend of cheeses that is used is out of this world. It gives the pizza a tangy, cheesy flavor, without being too overwhelming. The crust is outstanding. It is both crispy and soft, and supports the pizza and all its toppings. 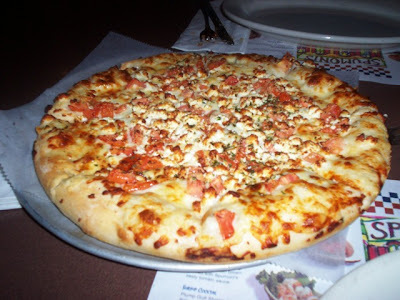 I usually get the individual size for myself, and although Mom doesn't like diced tomatoes, she loves the flavor of this pizza. It is definitely one of the best pizzas I've ever had. We needed change, which rarely happens, but Angelica quickly cashed us out and we left her a 20% tip. She was an excellent waitress, and that is another thing we love about Spumoni's - we've never had anything but excellent service. From the hostess to the busboys, everyone is always pleasant, their uniforms (with ties) are always neat and clean, and they never forget to come around and ask how the meal is. Although we didn't use the restroom on this occasion, we have in the past and it has always been very neat and tidy. With full stomachs and the Styrofoam box in hand, we left Spumoni's extremely satisfied and already longing to revisit. 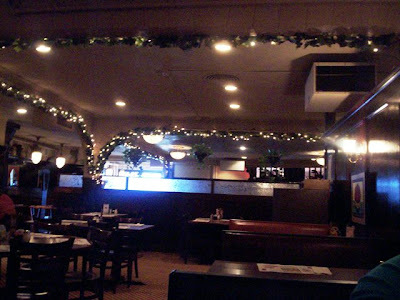 We love the atmosphere, the prices are fabulous, and we've never had a bad meal at Spumoni's. As we were leaving at around 5:15 p.m., we saw customers start to pile in. The food is definitely the reason why this place is so popular, and I would definitely recommend Spumoni's to anyone looking for a delicious Italian meal. Mangi! Spumoni's is open on Sundays from 11:30 a.m. to 9:30 p.m., Monday through Thursday from 11:30 a.m. to 10 p.m., and Friday and Saturday from 11:30 a.m. to 11 p.m.